Solar spectral irradiance, UV, and declining solar activity – a Maunder Minimum mechanism for cooler temperature? | Watts Up With That? Solar spectral irradiance, UV, and declining solar activity – a Maunder Minimum mechanism for cooler temperature? Since Paul Hudson has made a bold claim at the BBC related to a recent interview with solar scientist Mike Lockwood: BBC – Real risk of a Maunder minimum ‘Little Ice Age’, I thought it appropriate to share this recent communications that raises some of the same issues about the UV portion of the solar spectrum during this lull in solar activity, which has been in significant decline in the last decade. especially in the UV regions. [This has] significant implications for atmospheric chemistry and its modeling, while also suggesting that the spectral variability in some other important regions of the solar spectrum (visible and >1μm IR) is not in phase with solar cycle – which I think is potentially another huge elephant in the room for CAGW. 2. Failing to take into account that ocean has considerably lower reflectivity than is the Earth surface average and therefore absorbs way over average solar irradiance than the Earth surface in average absorbs under same insolation. -which both very likely result in gross underestimation of the incoming solar irradiance (the 160W/m^2 figure) for ocean. (from my own calculations (using the above ocean geographic stratification, atmospheric spectral absorption and seawater optical properties numbers) comes out that the average effective ocean insolation is well over 200W/m^2 -even if all ocean under sea-ice and therefore receiving no significant insolation is fully included into the averaging). 390W/m^2 figure and which would be already almost 4 W/m^2 lower even in quite still rather unlikely case the sea surface has ε=0.99 – which is usually the emissivity of standard laboratory blackbodies. Not speaking that higher evaporation and higher atmospheric temperature resulting from higher insolation inevitably causes more water in atmosphere, more latent heat released there, eve higher atmospheric temperature resulting in higher atmospheric radiation slowing heat radiative transfer from the surface. …which results in very uneven heat content distribution and so the surplus irradiation caused by the solar cycle insolation variation very likely doesn’t produce so prominent temperature signal amplitude at the shallow depths where the SST is usually measured (at very least not in such phase with solar cycle variability to be easily quantifiable and comparable) and doesn’t reflect more than part of the actual heat content changes in the ocean photic layer caused by insolation variability. the surface temperature data while the heat content throughout the photic layer anyway rises and descends with the solar cycle variability at the depths higher than is the depth of the layer heated by the solar IR. The surprising finds from the SORCE SSI data by Ermoli et al. (I must say I’m also very surprised when looking into the SORCE SSI data) could be interesting maybe even for the WUWT readers. -Even the spectral irradiance is quite special topic, I have a feeling that if ever there will be a comprehensive linking between solar activity variability and surface temperatures, it will come from the side of the spectral irradiance variation – because it is what in different bands causes the different ocean surface layers be heated considerably differently due to very different water transmissivities for different wavelengths. (- only what I found at WUWT about the Ermolli et al. paper is the very short note in the Oct 13 roundup linking to the Bosse&Vahrenholt article mentioning the paper – but unfortunately without mentioning the main focus of the article – UV variability and atmospheric chemistry – and rather seems to just point out quite cherrypicked figure “10%” variability – which one in fact finds in the SORCE SSI data actually at the edge of the MUV region – almost completely unsignificant for surface irradiation, and actually the variability upperbound for UV significantly reaching surface is lower at least by factor 5. P.S. : In the attachment you find a picture you can have some fun with. Abstract: This report assesses research on the interactions of UV radiation (280–400 nm) and global climate change with global biogeochemical cycles at the Earth’s surface. The effects of UV-B (280–315 nm), which are dependent on the stratospheric ozone layer, on biogeochemical cycles are often linked to concurrent exposure to UV-A radiation (315–400 nm), which is influenced by global climate change. These interactions involving UV radiation (the combination of UV-B and UV-A) are central to the prediction and evaluation of future Earth environmental conditions. There is increasing evidence that elevated UV-B radiation has significant effects on the terrestrial biosphere with implications for the cycling of carbon, nitrogen and other elements. The cycling of carbon and inorganic nutrients such as nitrogen can be affected by UV-B-mediated changes in communities of soil organisms, probably due to the effects of UV-B radiation on plant root exudation and/or the chemistry of dead plant material falling to the soil. In arid environments direct photodegradation can play a major role in the decay of plant litter, and UV-B radiation is responsible for a significant part of this photodegradation. UV-B radiation strongly influences aquatic carbon, nitrogen, sulfur and metals cycling that affect a wide range of life processes. UV-B radiation changes the biological availability of dissolved organic matter to microorganisms, and accelerates its transformation into dissolved inorganic carbon and nitrogen, including carbon dioxide and ammonium. The coloured part of dissolved organic matter (CDOM) controls the penetration of UV radiation into water bodies, but CDOM is also photodegraded by solar UV radiation. Changes in CDOM influence the penetration of UV radiation into water bodies with major consequences for aquatic biogeochemical processes. Changes in aquatic primary productivity and decomposition due to climate-related changes in circulation and nutrient supply occur concurrently with exposure to increased UV-B radiation, and have synergistic effects on the penetration of light into aquatic ecosystems. Future changes in climate will enhance stratification of lakes and the ocean, which will intensify photodegradation of CDOM by UV radiation. The resultant increase in the transparency of water bodies may increase UV-B effects on aquatic biogeochemistry in the surface layer. Changing solar UV radiation and climate also interact to influence exchanges of trace gases, such as halocarbons (e.g., methyl bromide) which influence ozone depletion, and sulfur gases (e.g., dimethylsulfide) that oxidize to produce sulfate aerosols that cool the marine atmosphere. UV radiation affects the biological availability of iron, copper and other trace metals in aquatic environments thus potentially affecting metal toxicity and the growth of phytoplankton and other microorganisms that are involved in carbon and nitrogen cycling. Future changes in ecosystem distribution due to alterations in the physical and chemical climate interact with ozone-modulated changes in UV-B radiation. These interactions between the effects of climate change and UV-B radiation on biogeochemical cycles in terrestrial and aquatic systems may partially offset the beneficial effects of an ozone recovery. 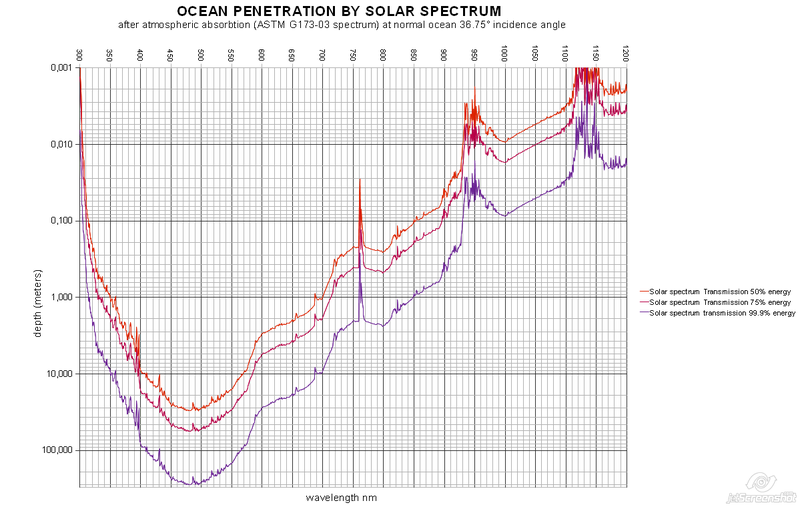 UV penetrates the oceans to 300 m. A lag today will only be climatologically evident after a decade. An anthropocentric view? The spectrum at our orbit is 40% IR, 40% visible and 20% UV. Only 1% of the IR reaches the surface. TSI reconstructed chart 1610 to 2012. Central MN averages 270 cloudy days per year. This summer we wuz robbed. Crop this wet year Ok, but nothing like last year’s drought plagued harvest. The millimeter wave regions are also intriguing – but there is little historical data to work with. I think we will survive? Most sunlight is in the IR, not visible part of the spectrum. 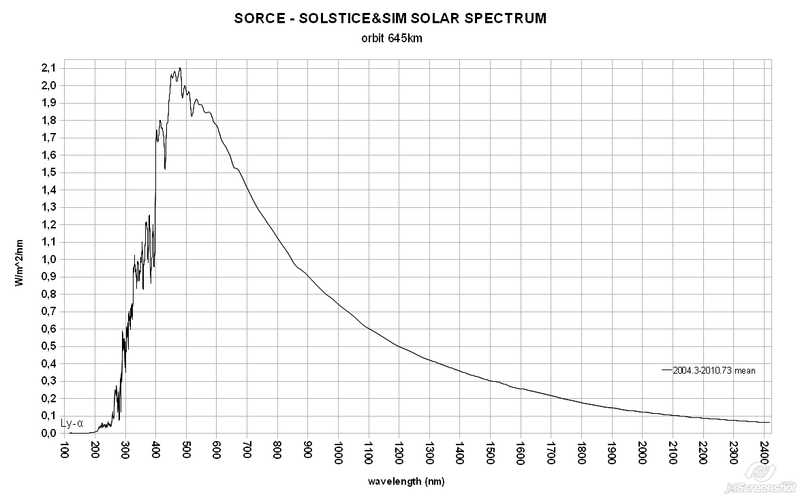 The spectral distribution of the solar energy at sea level comprises roughly 3–7% of UV (290–400 nm), 44% of visible light (400–700 nm), and 53% of infrared (IR) radiation (700–1440 nm), at a power of about 1120–1000 watts/m2. But at the top of the atmosphere, the distribution is about 10% UV, 40% visible & 50% IR, at 1366 watts/m2. Two solar threads in two hours ! The sun must be entering an active phase. ” at sea level” incoming radiation, apart from the most energetic UV, is scattered. The atmosphere heats the surface primarily by conduction. It would be educational to the audience if the Ev of the wavelengths were also put in the labels. The variability of the energy has big effects on the output of solar cells. If the photons do not generate carriers they just contribute to the heat. A standard Sun illuminator is now used to evaluate solar cells. The energy of the photons at the higher energies drive a lot of important photochemical reactions. There is also a whole world to be publicised in the far Ir and millimetre waves. These wavelengths have effects on organic molecules and who knows what else.. True, but solar UV is a major driver of atmospheric chemistry especially in the upper atmosphere. For this reason while UV is relatively small portion of solar radiance energy wise, variance in UV could have significant impacts on how efficiently the earth sheds heat to space. Re the optical depth spectral sensitivity of the ocean, even RealClimate admits longwave infrared from greenhouse gases cannot penetrate or directly heat the oceans. RC claims GHGs heat the oceans by decreasing the temperature gradient, but since there has been no increase in atmospheric temperature for 20 years, there has been no decrease of the temperature gradient, and hence no heating of the oceans by increased greenhouse gases. I neglected to paste his comment heading. Of course, a plot of the TSI database averaged over the most recent 11 years follows the change in temperature during the 20th century a lot better than a monotone series of CO2. But I am not saying anything new here. D’Aleo noticed that a long time ago. Add in the ENSO and AMO, and you get a model with predictive ability. But nobody ever got a grant to investigate something simple and easy you know. As alluded to by HockeSchtick and others, IR does not penetrate the surface. Whatever the state of matter absorption of IR raises a molecules kinetic energy which it immediately shares by conduction with its surroundings. Re-radiation of IR at the secular wavelength of its absorption is negligible. The emissivity of solids like dirt, green leaves, even snow is on the order of 1000 times stronger than low pressure gases. The direction of long-wave radiation is overwhelmingly one from the surface to the atmosphere and outer space. Gary read what you wrote. The atmosphere does not heat the surface. It’s vice versa. I think it is a mix. An Arctic Air mass can cool off a region and a chinook can heat it up. And we don’t dispute the comparison, but their heat capacities(air and earth) are vastly different. “I have combined the PDO, ,Millennial cycle and neutron trends to estimate the timing and extent of the coming cooling in both the Northern Hemisphere and Globally. So, would the 0-2000 meter ocean heat content increase being greater than the 0-700 meter ocean heat content increase be a fingerprint of solar caused warming? It seems to me that without the invoking of convenient wind changes or other heat distributing mechanisms a increased GHE caused warming should increase the ocean heat content via a mechanism akin to insulation therefore from the top down. Whereas an increase in solar output proportion in the deeper penetrating visual and UV wavelengths would warm from some depth up & down. Sometimes not vastly, especially when you take into account the ability to transfer heat like when it is foggy or raining or for that matter really humid, or when the wind is blowing hard. You know … things climate modelers and weather persons never get right. Increased solar magnetic activity and larger sunspot groups will increase ultraviolet radiation intensity, which means; more UV from the sun will produce more chemical reactions in the atmosphere. And an increase in ultraviolet radiation reaching earth will also release more energy as heat, emitting more infrared radiation into space. 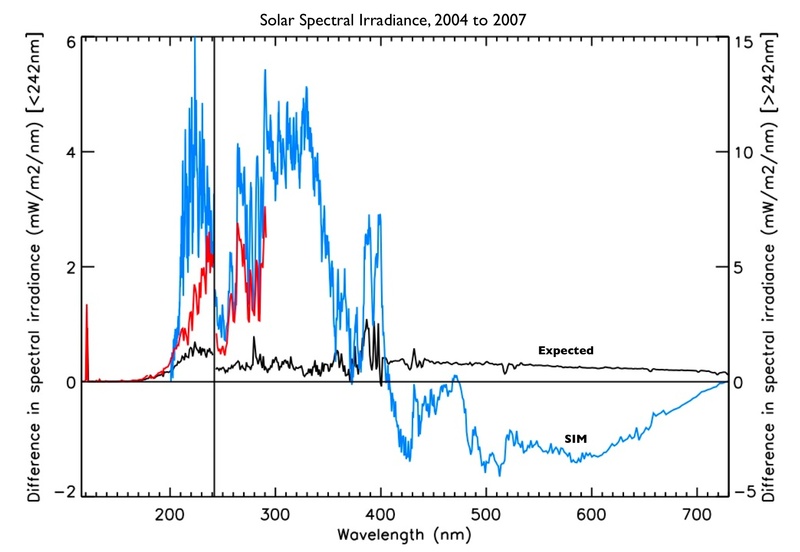 As solar magnetic activity has decreased and so has ultraviolet radiation, a scientist viewing less infrared radiation leaving the earth (as observed by satellites) may mistake this reduction in infrared radiation as a result of CO2 “trapping heat” or blocking more infrared radiation from escaping into space, when in-fact the “extra” infrared radiation was the result of the “extra” ultraviolet radiation. “How then can we predict the future of a constantly changing climate? A new forecasting paradigm is required . Much appreciation for your work. My wife and I are seriously considering moving to south Florida, something we would consider in any case given our recent retirement. The idea of using the neutron count as a useful proxy for changing solar activity and temperature forecasting is agnostic as to the physical mechanisms involved. Friction between air and surface is the heating mechanism for Chinook not TSI. @Dr Jan Zeman: Wonderful thing to see work being done on spectral components. Thanks for the post. 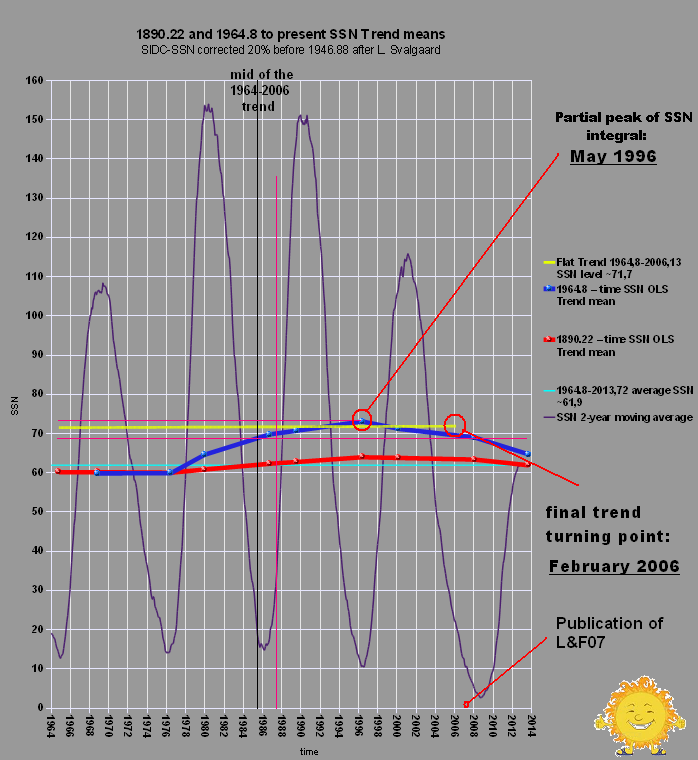 “Furthermore Fig 8 shows that the cosmic ray intensity time series derived from the 10Be data is the most useful proxy relating solar activity to temperature and climate. There is good evidence that part of this is a circular argument, i.e. that the cosmic ray proxies are significantly contaminated by climate, e.g. http://arxiv.org/ftp/arxiv/papers/1003/1003.4989.pdf and http://arxiv.org/ftp/arxiv/papers/1004/1004.2675.pdf and are thus directly useful without serious caveats. In context I’m obviously including the 10 Be data in that statement. Why exactly it correlates with temperature I don’t claim to understand ,merely I say that it looks like a reasonable usable empirical correlation at the various temperature minima in the Steinhilber Figure referred to. Could it be that the fact that they might be “contaminated” or say rather influenced by climate is in fact the reason for the correlation?? As far forecasting is concerned while it would be comforting to understand the mechanism it is not essential. Keep saying the same thing does not make it right. climate is in fact the reason for the correlation?? As far forecasting is concerned while it would be comforting to understand the mechanism it is not essential. But if climate is the cause then the Sun is off the hook and the whole edifice falls down. As far as forecasting it makes a large difference because then you would be forecasting climate with climate. I think you have finally twigged what I’m mainly doing – given that the temperature data is the chosen climate metric – in my case the SST’s – then the best method of forecasting is by looking at quasi periodic cycles in the temp data itself e.g. the 60 and 1000 year cycles figuring out where we are now and projecting them forwards. As for the rest your just playing with words to be argumentative . Obviously the sun is the main driver and is responsible for the 10Be flux . Note the question marks in the comment I’m merely suggesting that the climate at the time affects 10Be deposition ( obviously not the production)- which is a commonplace observation. As for the rest your just playing with words to be argumentative . Obviously the sun is the main driver and is responsible for the 10Be flux . I never play with words to be argumentative. My goal is to be informative. My point is that we do not know what the 10Be flux was, only the [climate contaminated] 10Be concentration. Making some assumptions about the deposition, e.g. by measuring the thickness of the annual layers, we can get a rough idea about the flux. But I will not complain about you trying to look for cycles in temperature data and extrapolate those for forecasting [although I personally don’t think that is very useful], but this post is about solar variations, not climate cycles. “I have been forecasting global cooling based on quasi periodic quasi repetitive patterns and solar activity decline for several years now. Seems reasonably well on topic. Why don’t you think it is very useful? What method do you think is currently more useful – modeling is obviously hopeless. I don’t think there is a useful method at the moment. Cyclomania is not very useful, unless you know the physics [e.g. we can predict that summer will be warmer than winter, because we know why]. At some point in the future modeling will eventually work. is particularly maniacal to me – looks more like being a very obvious Occams Razor type working hypothesis which can be tested in the fairly short term say by 2018 -20. I don’t think that to suggest the temperature peaks in 60 and 1000 year cycles coincide in 2003+/- is particularly maniacal to me – looks more like being a very obvious Occams Razor type working hypothesis which can be tested in the fairly short term say by 2018 -20. Testing a 1000-yr cycle in 5 years time does strike me as a bit cyclomaniacal. Thank you, again, for all your instruction here on WUWT. Actually Leif seems to me to be in an unusually benign mood tonight – almost affable in fact. Just trying to be fair, if the real data was “colour” and grey was extrapolation, this study seems to be long on extrapolation. Do I smell a model? Dr. Page, I’m glad you posted that. It showed that I need to clarify my sloppy writing. btw, below, I am not attacking your assertions, just sympathizing with Dr. Svalgaard looking at the above dialogue from his point of view. @Dr. Svalgaard: I did not think you were displaying a bad mood above. I just thought you might be headed there after quite a long series of somewhat repetitive questioning which was sometimes based on misunderstanding what you said or was based on persistent assumptions the refuting of which I’m sure you found a bit trying at times. http://www.uksolphys.org/uksp-nugget/37-what-is-our-current-understanding-of-solar-irradiance-variations/ this is UVB data and compares well with Fig 4 above. …..quite very surprising results from the SORCE spectral irradiance data. I do not think we need to know why summer is warmer than winter to be able to predict that summer is warmer than winter. This in fact is the point Norman is making, and you help validate his thinking here. Not knowing why is not important in making that prediction. When I was a kid, I knew for a fact that summer would be warmer than winter because, well, it’s common sense to a kid to know this. Later, I learned why I was right – but that did not make me more right. En realidad no es obvio… That TSI reconstruction is based on sunspot group counts, which historically are biased by different counting methods. When that bias is removed the gradual increase in TSI disappears. 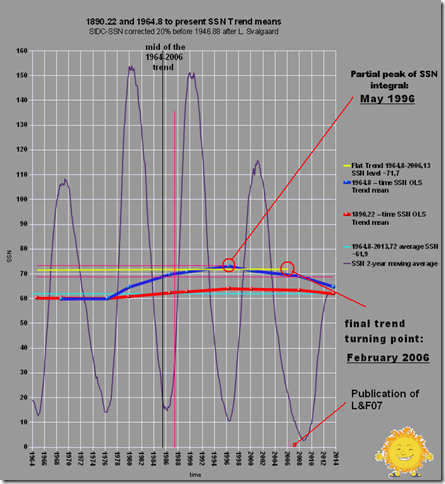 There are too many very cold seasons close to solar cycle maxima for this to be right. While a lack of Aurora regularly correlates to colder episodes. People planted crops based on the observed cycles for thousands of years before understanding why the seasons were there. They could predict that summer would be warmer than winter without any understanding of why. Cyclomania may not be very useful, but cyclophobia isn’t very helpful either. Wow, what a great line to read first thing this morning! Thank you, John. A couple of questions for you. 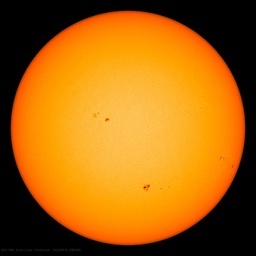 Why are the NASA and NOAA sunspot #’s about half of your active area counts? A different way of counting? Also, is this pattern near 1970, 1990, and 2013 at the beginning of each 22 year cycle meaningful? The pattern I am referring to is where it looks like the phases are going to cross and then they backtrack a bit and finally cross a year or so later. All my questions are referring to the graphics that Anthony has linked to his solar page. Thanks. The cycles coming from outside are predictable. There is a bit of chaos coming from inside (earth) but eventually outside will win from inside…. I remember that Leif called it a ‘junk” paper when I first queried him on it. So you must not always listen to what he says. Sunspot groups observed from 1901-1913, 1923-1933 were as the left diagram, while sunspot groups observed from 1913-1923, 1933-1944 were as the right diagram. Nicholson also pointed out that the length of the 22-year Hale-Nicholson sunspot cycle should be measured minimum to minimum, in as much as sunspots of both polarity overlap near and after minimums. to answer your peculiar question. It’s true: the amount of RF – for SIM, may have no significance. I. UV-B is a small RF … but, eg, it kills … (de facto kills phytoplankton – could influence cloud cover) and affects the decomposition – disables – block (or – if weakened – vice versa) great flow passages of large amounts of energy, changing the earth system’s ability to absorb the energy (eg ozone, clouds, water in the stratosphere, etc.). 13.5 … – Impossible? But however it was in the past! … or changed frequency of El Nino – worth reading: Quantification of the Feedback between Phytoplankton and ENSO in the Community Climate System Model, Jochum et al, 2010. John: We both agree. And we’re not saying “either all cycles are valid or none are”… Accusing someone of being a cyclomaniac ends the ability for cogent discussion and sides form. Animals have evolved to be good at seeing cycles and responding to them sometimes not even being cognizant of the cycles. The diurnal solar cycles have been shown to create processes which lead to melatonin production from the amino acid tryptophan. This believed to be related to what induces different states of our sleep processes. Animals did not need to prove the sun would rise for them to rely on it. Cyclomania, another word for hind casting. It worked very well for predicting SC24’s maximum. A lot better than other methods. Having said that, the prize went to the expert who kept changing his bet right up to the finish line. Cyclomania, another word for hind casting. meaning average temps. will fall by as much as maxima are falling now. by 2040 things will be the same here as it was in 1950. You can bet on that. Hindcasting is what the ipcc and their ignorant scientsists did, by looking at the rise in ST and linking it directly to be “caused” by an increased CO2 / GHG content. Then they came up with MODTRAN. Do you remember that? Allocating the values for each GHG increased since 1750, instead of understanding that the relationship is causal, i.e. more heat into the oceans releases more CO2. I am still amused by that. By the sheer immense stupidity of it. “Most sunlight is in the IR, not visible part of the spectrum. According to official standard global tilt surface reference spectrum the spectral irradiance for your bands is: 290-400nm 9.8%, 401-700nm 45.8%, 701-1440nm 44.2% for standard AM1.5 atmospheric conditions. The TOA distribution is 290-400nm 16.3%, 401-700nm 41.9%, 701-1440nm 41.7% for standard AM0 TOA spectrum. All percentages are relative to 100% – the whole partial 290-1440nm band irradiance. the question is about the variation in that amount TOA and what that (small) variation causes. i.e. from 1995 ozone (+ peroxides + ntric oxides etc) is rising, allowing (somewhat) less heat to accumulate into the (mostly SH) oceans. study ozone results NH and SH and my tables and you will figure it out. No, atmosphere heats surface primarily by IR radiation and not by conduction. The conductive net-heating is in direction surface-> atmosphere – and resulting convection, thermals, because it is the surface which is most heated by solar irradiation -simply because its materials have much higher absorptivity for solar spectrum than air – which results in higher average temperature than surface air has, absolutely preventing net-heat transfer from atmosphere to surface by conduction due to 2nd law of thermodynamics. In case of ocean and all seas lakes and rivers (and also wet land – especialy after rain) there is also another very powerful factor and that is heating of the atmosphere by latent heat of evaporation which on global scale transports around one third of the heat from surface to the atmosphere which the surface received by absorbing solar irradiation. Yeah the comma should be decimal point, but I have european Open Office, so we have comma instead of decimal point – the Y axis is 100 meters, 10 meters, 1 meter, 10 centimeters, 1 centimeter, 1 millimeter. Mind the also the scale is logarithmic – in fact the penetration depth differences are huge – several orders of magnitude for different parts of the solar spectrum and are of course also dependent on incidence angle – but not so much, because there is always big refraction on the air/water interface for high angles – for example at 60° incidence angle the penetration angle is only ~40° after refraction. The graph is for 36.75° incidence angle, which from what I calculated from the ocean/land stratification is the average day (sunrise-sunset) incidence angle for whole global ocean and whole year equinox-equinox. The calculation of the graph values was made that I took the ASTM G173-03 standard surface spectrum and half-transmittance (50% absorbed – 50% transmitted) depth numbers I obtained using water empirical absobtion index taken from multiple sources in the literature then I multiplied the spectral irradiances by the calculated halftransmittance depth, normalized the results back to halftransmittance penetration depth and recalculated for the 36.75° incidence angle and its respective refraction angle 26.64° + then I made the same for quarter-transmittance (75% absorbed 25% transmitted) and for 1/1024 transmittance (1023/1024 absorbed and 1/1024 transmitted). It is just a first estimation – there for example is omited the surface spectral reflectance – but it would anyway not change the result much because water refraction index varies little over the part of solar spectrum in question. I think that joker in the pack will be also the over 1 micrometer IR antiphase variation – if confirmed all the hypotheses so far about solar activity – sea surface temperature relation will go straight to the bin. I would be surely interested in some more ozone data, it could be useful for my global empiric insolation model I’m working on. 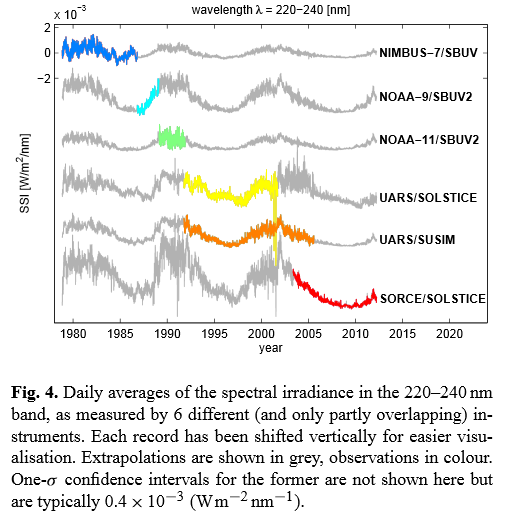 Most important in UV for surface insolation is 300-400nm – there the solar cycle variation according to the newest SSI data from SORCE SIM looks like over 2% and absolute like ~7mW/nm ( ~0.7W/m^2 at TOA variation for whole band – more than half of the TSI solar cycle variation), so it would be nice to know even better how much of it really gets to the surface. Actually it was just email to Anthony suggesting the Emolli et all article, but he somehow decided to publish it. With the spectral irradiance much more to come. Ozone recovery percentage wise since 1995 is much more spectacular in the SH than NH. otherwise you end up writing a load of rubbish again. Here I don’t understand. Heat, what heat? Coming where? From where to where? Going up? or Going down? If you mean incoming solar radiation – which is not “heat” but EM radiation (- photons if you like – although it is not exact, because EM radiation is EM field not particles and becomes particles only in case it encounters a mass – but it is not important in this case) which is something completely else than heat – I can immediately explain why Southern hemisphere appears different than the Northern hemisphere. That’s because of ocean – the ocean is the thing which absorbs ~90% of the solar radiation reaching the surface of Earth! – there’s considerably more ocean at the Southern hemisphere than at the Northern hemisphere, the area ratio is SH ocean 57.2% to NH ocean 42.7%, but bulk of the Southern hemisphere ocean is at considerably lower and considerably more insolated latitudes – especially at mid latitudes (there’s no ocean in Antarctica, but there is ocean in Arctica) than the ocean at the Northern hemisphere. Moreover we are in such phase of ~21000 years long axial/apsidal precession cycle where southern solstice is almost in exact phase (just ~12 days off) with Earth’s perihelion (-when Earth on its eliptical orbit is closest to the Sun). So that’s another part of the reason why Southern hemisphere receives considerably more effective (absorbed) insolation than the Northern hemisphere. The difference which make this two huge co-factors (ocean absorbing considerably more solar radiation than land and insolated more because in time of southern solstice the Earth is closest to Sun – the difference in TOA TSI between perihelion and aphelion is over 90W/m^2!) in the heat budget are dozens of Watts per square meter when averaged over whole hemispheres – even without any regard to atmospheric composition whatsoever and it has almost nothing significant to do with ozone column in the atmosphere. Ocean water moreover has immense heat capacity (far highest from all common materials), so is able to buffer the heat without much changing temperature and because it is liquid it is able to transport the immense heat contents elsewhere through oceanic currents – that’s why parts of east coast in America – and even northeast Canada and western Europe -even at quite high latitudes is so warm – due to transporting huge amounts of heat through south-north Atlantic current, which even more is then heated in Carribean sea and in Gulf of Mexico but significant part of the heat in the current even comes from Southern Indian ocean and even equatorial Pacific! Will someone please come to a conclusion as to whether this is decent science or not? All the back and forth between brainiacs is confusing to a lay person. And no one has laid out the arguments in a clear enough fashion to let anyone know the final conclusions or even what’s the general arguments are. Welcome “The Watcher”. If it does not seem clear, then the hypothetical and theoretical science is working. But I do look forward to one brave sole making a clarifying statement, so that for a brief moment it will appear to be settled science. Maxima is a good proxy for evaluating energy coming in, and how that varies. Means is a proxy for heat being trapped, i.e. energy -out. So, like you figured, what we have is heat coming in the SH that is mostly transported due to evaporation, currents and weather, to the NH. Here it is trapped, mostly by advancing green. Although you do not feel the heat of the UV part (and below) on your skin, eventually all UV ending up in the oceans is converted to heat, most at greater depth as opposed to the IR which converts at lower depths. What we see from the tables is that fluctuation in the amount of energy coming through the SH into the oceans is what causes warming and cooling periods. Since the ozone started increasing we can be sure that the peroxides and n-oxides are increasing as well; so in general, more UV is being deflected to space TOA. From the drop in maxima you can predict that global cooling will last until around 2040. Mind there is difference between EM energy coming in and what from it really gets absorbed , converted to heat and how deep in the surface. Some materials have high absorptivity, but high opacity – so absorb only on the very surface, warm more and dissipating heat faster (I remind you that radiative heat dissipation rises with fourth! power of temperature) some not – as the sea water – which is very abundant at the SH, especially at lower more insolated latitudes. Yeah, apparently, but again it is not caused by different transmission through atmosphere, but by axial/apsidal precession phase together with abundancy of low reflective/highly absorbtive water there. Temperatures aren’t good proxy for heat content, because different materials have very different heat capacities and therefore warm differently upon receiving same amount of radiative energy. Moreover heat content if trapped in significant amount (10^21 joules and more) it is trapped in the lower layers of the ocean photic zone and throughout thermoclines in sea of immense heat capacity – and therefore has only very minor direct effect on surface temperatures and is very hardly measurable -although the amounts of the heat are immense – just 4 meters thick layer of ocean at average SST has way higher heat content than whole Earth’s atmosphere. I don’t think biosphere trapps any heat – all living organisms produce and dissipate heat – in huge amounts – the energy source for the heat? Primarily photosynthesis. Yeah, but the reason why you don’t feel the UV so much as IR is that UV is absorbed at considerably longer penetration depths in the skin, so the heat content it creates is much more distributed, doesn’t rise much temperature of the skin and so doesn’t immediately irritate the temperature sensors in the skin – unlike the IR. – this can prove dangerous – as you can get burnt seriously by UV, not feeling it much. Most of UV photons carry twice and more energy than IR. Warming and cooling periods on the short scale are caused by solar activity changes (almost solely), at longer timescale (of dozens of thousands of years) by precession cycles, changes in obliquity and eccentricity and on even longer timescales (millions of years) most likely by solar system travelling through different areas of the galaxy – solar system unlike many other star systems in Milky way is not bound to galaxy arms because it has too high orbital speed (almost one thousandth of the speed of light!) and circles the galaxy around once in 250 million years – encountering different interstellar environments. Yeah, slightly, more to come. Ozone doesn’t deflect UV to space, it absorbs it and warms, the ozone creation is itself caused by irradiance in XUV-FUV region and if you know something about solar spectrum variablity you know that increase in this regions marked by ozone rebound is not good sign in case of a small solar cycle – it is ballanced by decrease in SWIR, which has dire implications for water cycle and therefore for biosphere. I don’t know anything about the predictions from drops, but I think I can predict it from the solar indices by methods based on serious sound physics, mathematics and statistics, having nothing to do with the cyclomaniacy usually present in this discusions, and detail analysis of global irradiance and heat distribution stratification. Some in IPCC try model this things using invented factors and “tuned” algorithms …and miserably fail, I calculate them from real, carefuly checked data – by far not all you find in scientific literature is always based in reality, or useful, not speaking about internet, it is sometimes nightmare work even with most recent data from most renowned space agencies, even with them it usually takes weeks of filtering out the frequent artifacts caused by bad raw data recalculation algorithms, before they’re ready for a serious research. That is where a lot of people misunderstand. It does not warm the atmosphere.. At least not much, because a gas has little mass. After absorbing, in the absorptive areas, it re-radiates at those wavelengths where absorption takes place. Without the GHG’s up in the sky we would probably fry….you must understand the principle of re-radiation, in the case of absorption by a gas. In fact if you understand that you will agree that this makes the term GHG totally untenable. GHG’s also cool the atmosphere. Here is my take on it. If you understand all of that, you will get there. I don’t have problem with understanding what ozone does in stratosphere and that its effect is not classical effect of GHG in troposphere (I somehow happen to have more than groundschool) – which is where you make mistake with inadmissible generalization. Of course GHGs also cool – all gases in atmosphere cool, because they radiate due to having nonzero temperature – without it radiating – you’re right – we would not discuss this here, because we would be toast by the Sun – as the radiation is only significant way Earth dissipates the heat resulting from absorbtion of solar irradiance. I also note the solar surface has considerably higher than “5525K” temperature and even higher than usually stated 5778 K – the solar surface temperature can be estimated from Planck distribution fit to actual solar spectrum and its peak wavelength – which is not 502nm -as sometimes measured at surface, distorted by higher atmospheric absorbtion at the left side of the spectrum, but about 475nm – as measured by latest spectral irradiance instruments in space, so Sun’s effective surface temperature could be estimated as about 6100 K, but even that is likely underestimation, because solar spectrum is also distorted by solar corona. On the other hand I note the outgoing radiation from Earth (besides the radiation spectrum is pretty wide and generally looks pretty differently than at the picture you link – the picture is nonsense, the solar spectrum has pretty different shape than Earth radiation spectrum) has considerably higher peak wavelength than your “9-10” micrometers, because atmosphere has effective temperature of about 255K and the atmospheric window is pretty narrow. There also doesn’t exist anything like “saturation effect” when it comes to radiation absorption – but higher temperature causes gases to radiate more and also expand (the atmosphere is not in airtight vial and more or less keeps with Earth only due to gravity) so the absorption crossection locally diminishes accordingly – which nevertheless doesn’t in any way change the atmospheric optical thickness – which is upon what you argument in the linked text more or less completely colapses. One point of the graph was to show that of the 100% solar TOA only 70-75% makes it to the bottom. at sea level, on a cloudless day. They measured this re-radiation from GHG’s as it bounced back to earth from the moon. So the direction was sun-earth (day)-moon(unlit by sun) -earth (night). Water is a different story. In water, where there is also absorption of light (in the UV and IR), but here eventually it has to convert to heat. That is because there is mass. Big time. That is how earth is heated, for a very great part. I hope you will get it.. Nothing disappears. But where it goes is quite simple: part is reflected by atmosphere, part is reflected by surface, which together make what is called Bond albedo + part is absorbed by atmosphere – especially in UV and IR region, especially by H2O and O3 and bits also by O2, CO2 and CH4. I don’t say anything like that. Amount of reflected solar irradiance by atmosphere and surface is in fact considerably higher than the part which is absorbed by atmosphere. Eh, Earth IR radiation is in my opinion much better measured by satellite at the night side, dark Moon reflection is quite contaminated by solar IR reflected by Earth’s atmosphere. There is atmospheric re-radiation of solar irradiation, but only at the absorption bands. Again, I don’t know about any physical principle which would imply absorption saturation. If you have peer reviewed literature implying otherwise, I would like to see it. Ocean has sufficient optical thickness to completely absorb all wavelengths of solar irradiation which pass the atmosphere and air/water interface and has so low reflectivity, aided by waviness at high incidence angles, that its reflectivity for solar spectrum which reaches surface is in average less than 0.04. “but here eventually it has to convert to heat. That is because there is mass. Big time. That is how earth is heated, for a very great part. Yeah, I actually calculated the global water solar irradiance absorption using real data stratified gridded insolance model, detail empiric spectral water optical properties research and detail research of real data about solar spectrum and I came to the firm conclusion water absorbs and converts to heat around 90% of all solar irradiation reaching surface of Earth and the amount of absorbed irradiation when averaged per square meter of Earth surface including land and polar regions is almost 30 Watts per square meter higher, than the oversimplistic, in many aspects unreal models as e.g. Kiehl-Trenberth global budget purport. All due to water absorbing the radiation in considerably higher depths of ocean than where its surface temperature is usually measured and generally considerably more than previously estimated. So yes, I get it. you put your own words in italic which made it look like I said it. But I did not say that. the idea of the paper is to see what bounces from the moon (that came from earth) back to earth. 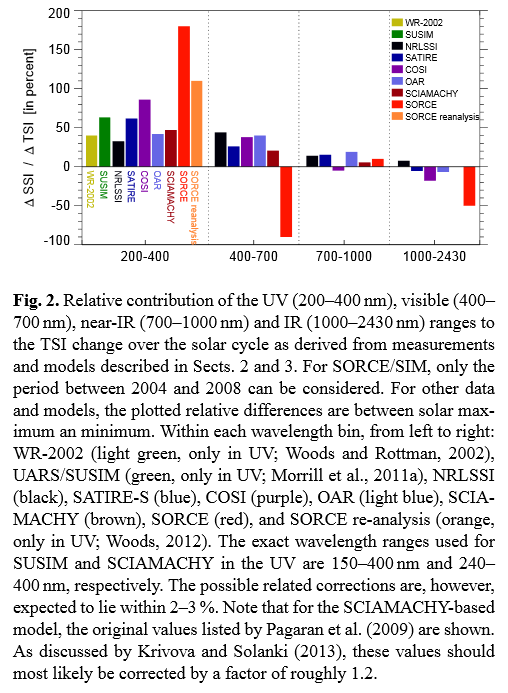 Note (from that paper) that not only IR is reflected from earth but also some UV and far IR. there is no other way to explain that we can measure & identify the absorption spectrum of a gas by looking at the radiation bouncing back from the moon? O2 (& HO & NO) + (more) E-UV => (more) O3 (& peroxides & others) => (more) UV to outer space and (less) UV into the oceans. This is where the warming and cooling periods come from, mostly. Hence it is now cooling. Don’t worry, there are actually not too many of us who have figured this one out yet. Hence you will not find it in a paper. Anyway, it looks like we are agreed now on most issues. I doubt this is so. When I proposed this ‘coincidence’ many moons, nay years, ago on the now inaccessible ‘channel 4 Eve forum’ I was met with derision, or at least ‘disbelief’. Perhaps the ‘climate’ for new thinking may be more receptive now than it was then, but ‘a bias’ to incoming ‘insolation’ still isn’t a factor for the exulted ‘TSI’ because of the ‘total’ aspect (it’s more ‘relative’).